We’d love your help. Let us know what’s wrong with this preview of The Great Jeff by Tony Abbott. Life hasn't been great for Jeff Hicks. After years at his beloved St. Catherine's, he's forced to spend eighth grade in the public middle school, which he hates. He's no longer speaking to his former best friend, Tom Bender, because of "that burned girl Perfect for fans of Gary D. Schmidt comes the companion to the modern classic Firegirl from acclaimed writer Tony Abbott. To ask other readers questions about The Great Jeff, please sign up. That’s how Tony Abbott begins this amazing book about a boy shouldering the burdens of his parents. Jeff’s mother is an alcoholic who never got over her father’s death. Now she can’t hold down a job. The rent is way overdue. His dad bailed when his mom’s dysfunction got to be too much. When Jeff tracks him down, he explains why he left. Jeff’s dad can leave behind the clutter, but Jeff can’t. He can’t make his mom stop drinking. He can’t help her get a job. He can’t keep her from “selling off the furniture like body parts.” He can act like the adult. He can hope. But in the end, he’s at the mercy of others. No matter how much he tries to head off the shame, it will eventually catch up with him. He can try to keep the seedy hotels and homeless shelters under wraps from his friends, but the dirty clothes, unwashed hair, and hunger can only be hidden for so long. This book is Abbott at his best. He packs it with subtleties, metaphors, and literary connections. There’s so much to analyze. There’s the clutter theme introduced by his dad and the hope theme introduced through the class reading of The House on Mango Street. House on Mango Street theme: “I’m here right now. I might even love this place now. But someday, when it’s not right, I can leave. I’m not stuck here. Thank you to the #kidlitexchange network for the review copy of this book. All opinions are my own. The second I saw this book available to review, I knew I needed to read it. Firegirl, the companion to The Great Jeff, is a book I read aloud every year with my 7th grade classes. Jeff is a character we discuss a lot in terms motivations and traits. My students always make great inferences, but most of it is speculation. This book perfectly complements Firegirl and confirms a lot of my students’ i Thank you to the #kidlitexchange network for the review copy of this book. All opinions are my own. The second I saw this book available to review, I knew I needed to read it. Firegirl, the companion to The Great Jeff, is a book I read aloud every year with my 7th grade classes. Jeff is a character we discuss a lot in terms motivations and traits. My students always make great inferences, but most of it is speculation. This book perfectly complements Firegirl and confirms a lot of my students’ inferences. Thanks to @littlebrownyoungreaders and author @tonyabbottbooks for this free book to share with #midlife change. It comes out March 19. ⭐⭐⭐⭐/5 for this #mglit book about a boy experiencing housing instability and an alcoholic parent. Readers might remember Jeff from FIREGIRL by Tony Abbott; he was the bully/antagonist in that book, but now he is the protagonist and we get his story. 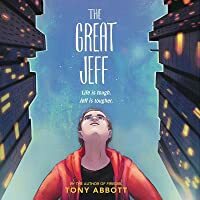 Jeff should be a thoroughly unlikable character except that as things get tougher for he and his single mom, he Thanks to @littlebrownyoungreaders and author @tonyabbottbooks for this free book to share with #midlife change. It comes out March 19. ⭐️⭐️⭐️⭐️/5 for this #mglit book about a boy experiencing housing instability and an alcoholic parent. Readers might remember Jeff from FIREGIRL by Tony Abbott; he was the bully/antagonist in that book, but now he is the protagonist and we get his story. Jeff should be a thoroughly unlikable character except that as things get tougher for he and his single mom, he changes and grows in surprising ways. Jeff is determined to keep his family’s problems secret, but a perceptive classmate named Hannah begins to suspect he is in trouble and offers help, but Jeff is too ashamed to accept. The shame of being homeless is explored in this book, but social workers, shelter staff and other helping professionals are all presented as kind and professional. Ultimately, Jeff and his mother need more help than they can find on their own and assistance comes from an unlikely source. Purchase for most middle school collections! This sensitive, moving story is multi-faceted and well-done. 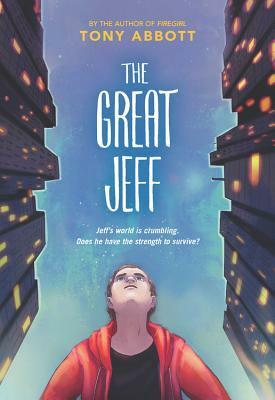 The Great Jeff is a sequel or companion book, to the 2006 novel Firegirl, and I found it necessary to have read the first book to understand Jeff's feelings about relationships in the new novel. Firegirl left me with questions about Jeff who was not the most sympathetic character and—from his behaviors in that novel—deserved to be ditched by his best friend Tom Bender. In this well-written, engaging novel, the reader learns more abut Jeff and his family and home life, and he becomes a more sympat The Great Jeff is a sequel or companion book, to the 2006 novel Firegirl, and I found it necessary to have read the first book to understand Jeff's feelings about relationships in the new novel. Firegirl left me with questions about Jeff who was not the most sympathetic character and—from his behaviors in that novel—deserved to be ditched by his best friend Tom Bender. Through it all Jeff stays positive and becomes resilient for his mom who only infrequently behaves like a responsible adult. “She’d taken over sounding grownup now. She had to sometime.” (158) He helps her hide their situation, despite his lack of clothing and the days he smells. This review has been hidden because it contains spoilers. To view it, click here. I thought this was a sequel to Firegirl, but it is not. Rather, it is a companion book, with a few overlapping characters. The story involves the changing family situation for Jeff Hicks, who has an absentee dad and a mom who drinks too much. The ending is a little too neat, maybe a little unrealistic. Still, Abbott delves into the subject of homelessness with care and sensitivity. A book that could help readers empathize with those who are, sadly, homeless or nearly so. Jeff's situation changes due to his parent's divorce, then his father's choices and his mother's alcoholism. It's a slow, inevitable slide that starts with changing schools and ends with the loss of the home Jeff's grandfather lived in. And, like many in this position, Jeff doesn't want anyone to know or where to find help. The biggest problem is that Jeff is unlikeable (possibly as a defense, possibly bec A book that could help readers empathize with those who are, sadly, homeless or nearly so. Jeff's situation changes due to his parent's divorce, then his father's choices and his mother's alcoholism. It's a slow, inevitable slide that starts with changing schools and ends with the loss of the home Jeff's grandfather lived in. And, like many in this position, Jeff doesn't want anyone to know or where to find help. The biggest problem is that Jeff is unlikeable (possibly as a defense, possibly because he's just a bit of a jerk) and when he talks about going FULL JEFF I just lost interest.